Every Sunday – 10:00 a.m. to 4:55 p.m. 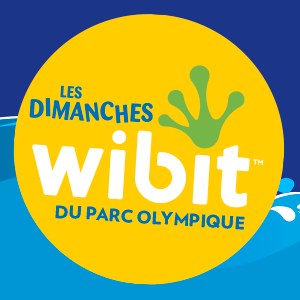 The Olympic Park Sports Centre invites you to discover the Wibit Sundays—located in one of North America’s most stunning aquatic centres. Every Sunday, an aquatic playground full of challenges, daring feats and fun takes over the 50m pool—site of the 1976 Olympic Games swimming events. Young and old alike will enjoy the perfect place to hang out with friends and family in one of Montreal’s most majestic sports venues. Come test your abilities on our water obstacles and inflatable tracks, where you can run, jump, slide, and swim your way to a whole lot of fun. Every Sunday, from 10:00 a.m to 4:55 p.m.
Children 6 and up who know how to swim can access the Wibit structure. Children 7 and under must be accompanied in the water and monitored at all times by guardian 16 or older. The ratio allowed is one guardian per three children; all guardians must wear a bathing suit and be in the water with the children.